Updated 10:00 am 4/19/2015: New SPC outlook graphics and new model graphics. Summary: Rain early AM. Break in the rain, then rain with possible severe weather overnight. It’s the weekend, so I’m only really going to focus on today and the start to your work week. Today, we are waking up to some rain that snuck in while we were sleeping. I know, that sneaky rain. It is expected to clear out of here by noon, giving us a break from the rain as we go about our day. The high will be about 75 degrees with a 70% chance of thunderstorms. This morning’s rain and storms aren’t what we are expecting to be severe. The Storm Prediction Center has published the following categorial outlook for Sunday at 7am through Monday at 7am. 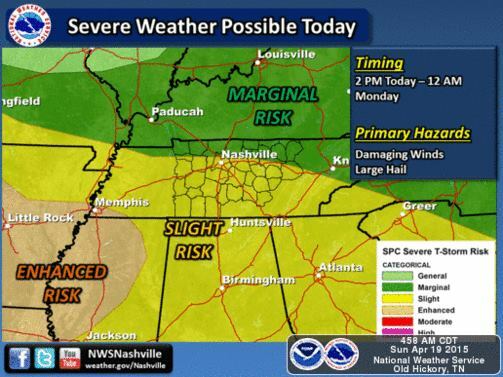 They have placed pretty much all of Tennessee in the SLIGHT category for severe weather during that time frame. Updated 10:00 am 4/19/2015: Updated graphic below. Updated 10:00 am 4/19/2015: The SPC has us in a 15% chance of seeing damaging winds 55+ mph within 25 miles of a point. Updated 10:00 am 4/19/2015: They also have us in a 15% chance of seeing large hail 1 diameter or larger within 25 miles of a point. Updated 10:00 am 4/19/2015: Finally they have us in a 2% chance of seeing a tornado within 25 miles of a point today. This is due to a cold front working its way to Middle Tennessee and is expected to come through Sunday night and early Monday morning. The greatest threat appears to be straight line damaging winds, large hail (over one inch in diameter), and maybe an isolated tornado (can never rule out a tornado with a cold front in the spring in Tennessee). Current prediction on timing appears to be between midnight and 4 am Monday morning. Here is the NAM4 at 2am, which doesn’t look too impressive. 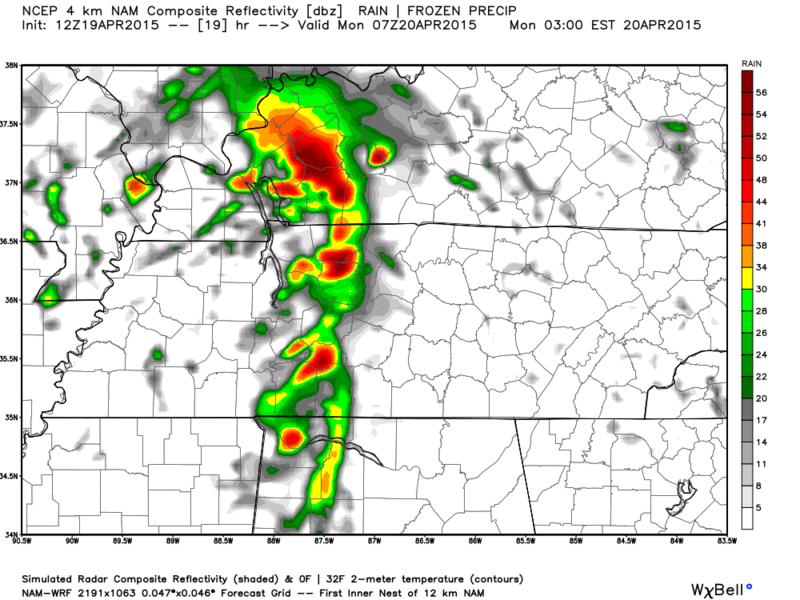 Updated 10:00 am 4/19/2015: The NAM4 is wanting to show some strong storms in a squall line at 2am in the morning (updated graphic). However, the NAM12 model paints a different similar picture. Here is it’s prediction for 4am Monday morning. Updated 10:00 am 4/19/2015: Updated graphic. 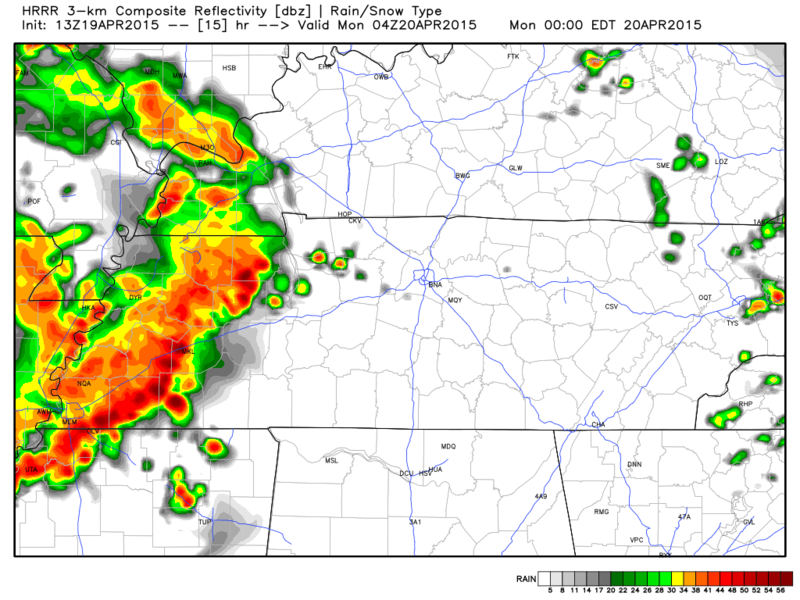 Updated 10:00 am 4/19/2015: The HRRR isn’t quite in range yet, but here is its current prediction for 11pm tonight, showing a squall line off to our west. Timing, severity, and other factors may change how the models predict what’s actually going to happen between now and tonight. My guess is that we will likely see an event that is between these two models. Once the HRRR model gets in range, that will help give is a better idea as this model is updated hourly and gives us a look at the next 15 hours. Any squall line that develops off to our west (in the ENHANCED category in the SPC outlook above) will likely lose some of the daytime heating energy by the time it gets here overnight, but how much energy it loses and how it interacts with the CAPE (convective available potential energy) that is here is yet to be determined. We will know more about the CAPE tomorrow as the weather balloons launched at 6am and 6pm by the NWS give us more insight into what’s going on. We’ve been pretty lucky this year in terms of no major outbreaks of severe weather. This is likely not going to be an outbreak of severe weather, but I do expect some severe weather warnings to be issued as the cold front works through Middle Tennessee. It’s definitely a night to keep your weather radio handy and close to your bed to wake you up should weather get rough. We will be updating the site as necessary today with additional details (likely new SPC categorial outlooks) as things become more in focus. 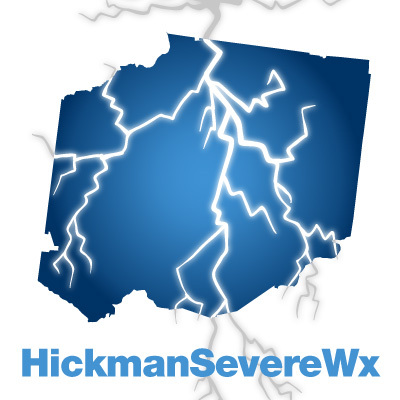 And if and when there is severe weather, we will be on Twitter giving you pinpoint information. Monday should be mostly drier after the cold front in the morning, except for a popup chance of rain after dark. Once the cold front moves through early AM, we are looking at temps staying relatively cool at a high of 67 degrees. There is a 40% chance of rain and thunderstorms today, but that is due to the cold front pushing in during the early morning hours and a slight chance of rain Monday evening. 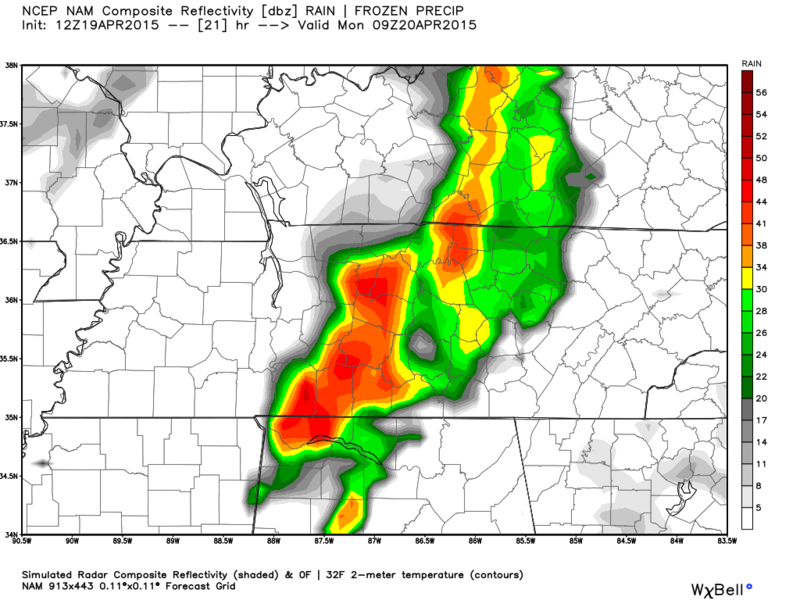 Here is what NAM4 is predicting for 7pm Monday night. Very spotty showers could pop up after dark Monday night. Tuesday we get a day without rain chances. Tuesday we see no rain chances as our high temperature will be about 65 degrees. But, Wednesday through the weekend sees rain chances again. Yep, I hate to be the bearer of bad news too.